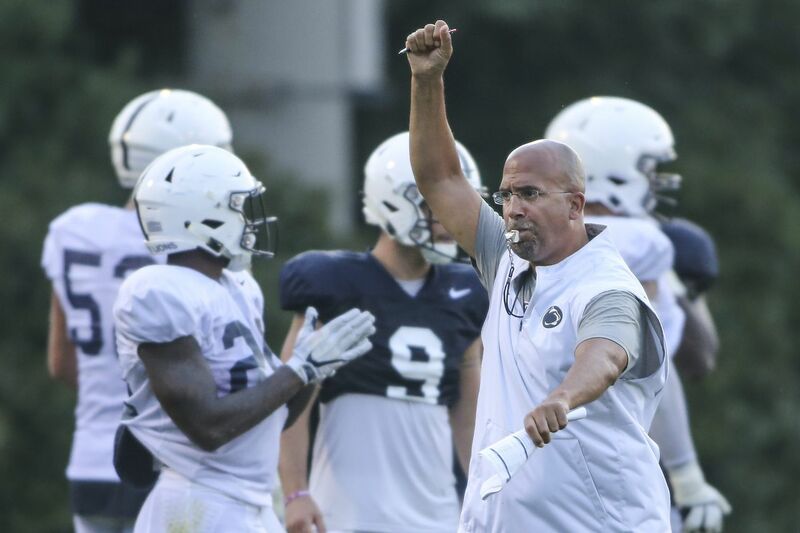 Even before James Franklin showed off the welts from an ill-fated paintball challenge, Penn State's head football coach, speaking at his media-day press conference earlier this month, was giving off a vibe that seemed slightly different from his first four seasons in Happy Valley. Call it job security or whatever you want — there was no recognizable chip on Franklin's shoulder. The man has never lacked confidence, but his words didn't suggest he had something to prove in an attempt to win the press conference. A couple of 11-win seasons can do that for you. That's why it's so interesting how this week CBS Sports released a poll of "one-fifth of the 129 active head coaches" in FBS football and the first published question, the one designed to get the most attention, was "Who is the most overrated coach in college football?" Tied for first, with Florida State's Willie Taggart, was James Franklin, 20 percent each. That means maybe five coaches listed Franklin. Talk about a chip on your shoulder. Two seasons back, when Franklin was still trying to get Penn State above fourth place in the Big Ten East, that kind of opinion had ammunition behind it. I wasn't the only one who wrote back then how it was time for Franklin to prove himself, to get some wins over Ohio State or Michigan or Michigan State or maybe move on. Well, 22-5 later, a Big Ten title, first- and second-place finishes in the loaded East, a Rose Bowl for the ages even if the last play went to the other guys — he's kind of proven himself, even if those five anonymous voters aren't buying in. The guess here is that those coaches want to give Joe Moorhead a big, big share of the credit for Penn State's recent success. Fair enough. Now give Franklin credit for hiring the then-Fordham head coach, for realizing Penn State's offense needed a schematic upgrade. Now that Moorhead has moved on to be Mississippi State's head coach, Ricky Rahne, who has been with Franklin since his Vanderbilt days, gets to prove he can call an offense. A former Cornell quarterback, Rahne already has shown he can pick talent, since he was the guy who showed up at a high school in Virginia and decided an undersized quarterback named Trace McSorley had what it takes. That poll is especially interesting because head coaches presumably know what it takes to be a head coach. Maybe the five Franklin dissenters believe Franklin had a quicker path to the top job than they did. Maybe they just don't buy into his cocky demeanor. When Franklin was hired, I talked to a coach who wasn't that impressed by him, going back to Franklin's days as a Maryland assistant coach. He knew people who knew him, that sort of thing. Those days are long past, though. If Bill Parcells was right about how you are what your record says you are, Vanderbilt fans would tell you Franklin is the best head football coach that school has had in the last half-century, after two straight nine-win seasons. Penn State fans will tell you they are more than fine with the hire made before the 2014 season. Showing the paintball welts was interesting in itself. Maybe it was a signal — hey, we have fun here, when practice is usually anything but fun. Franklin explained that teams were divided up and one team included coaches and administrators. When Franklin was hit and knocked out, there were supposed to be no more shots fired his way. That, Franklin said, was not the way it played out. The shots kept coming. Franklin showed a little welt on the back of his neck. Then he lifted his shirt and showed a bigger welt. Then he lifted his shorts — not that anyone was asking him to — and showed a massive welt. When reporters asked who had fired those shots, nobody claimed credit. The point of the whole thing seemed obvious, that Penn State football players aren't so scared of their head coach that they won't cause him slight bodily harm when given a free shot. Can you imagine this same scenario with Nick Saban? As Franklin related all this, and even more now that this little poll is out, I was reminded of a year I had spent as a reporter three decades back in San Diego. An athlete I covered closely there was named Phil Mickelson, then a high school senior, already playing in PGA events. Mickelson was easy to cover, sure of himself but always aiming to please. When Mickelson hit the pro tour after scorching the amateur circuit, I noticed comments from his fellow pros about how Mickelson was an Eddie Haskell type, putting up a front with that aim-to-please manner. The funny thing is, Mickelson carried that through his whole career and fans loved him for it. If it was a front, he has rarely let it down, through good times and bad. He's proven not to be a perfect guy, but history will treat Mickelson kindly beyond his glossy record. For Franklin, the long and windy road ahead will determined his ultimate standing. Right now, the big-time recruits are coming, and if the W's keep following, then the overrated coach could be in Happy Valley long after those five anonymous head coaches have moved on from their Anonymous U's.